Today was the main event. Even I'm tired from all of the events. This morning started with a hearty breakfast (the best meal of the day at Hunters Point in my opinion) Then it was off to the Christian Reformed Church that John and Dan's family attend. The pastor presented a genuine exegetical sermon (something I haven't heard for a long time) The church reminded me a lot of Pinehurst Chapel that I pastored in Everett; the building and congregational dynamics. 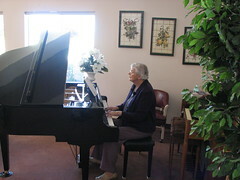 When we got back to Hunter Point, Mom got a chance to play some hymns for the residents as they congregated for the dinner meal. I skipped out on dinner and went exploring for a couple of hours. I went to the 'gates of the mountains' and found a dirt road through a scenic canyon. I met up with everyone at Dan's house, and after a visit in their home, John, Mom and Maybelle went back for supper and I climbed Mt Helena with Dan's family. It was a beautiful hike and a great time of catching up with Dan. After some Maria baked Lasagna, I rushed back to Hunters Point to visit with Dave, Twila and Matt who had just returned from Billings. Tomorrow is the long haul home if Mom can hang in there.